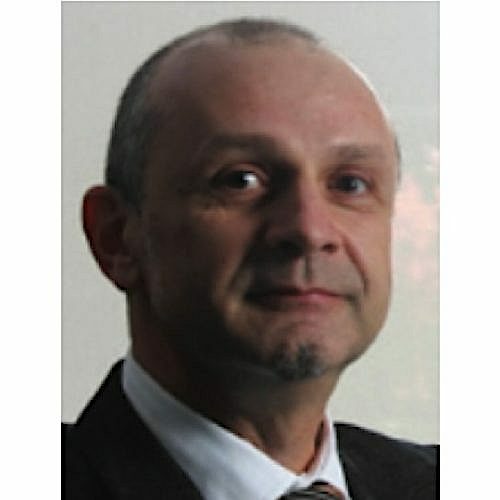 By Bogdan Comanita, PhD/MBA, Principal MarketChemica Inc. and member of Lee Enterprises Consulting, Inc.
VIRIDISOL®, ecoXTRACT® and GreenFlame® are examples of B2B brands launched in 2018 that support the use of new biobased products in large B2C markets. All these B2B brands are in perfect alignment with powerful B2C brands in markets as divers as pharmaceutical, cosmetics and hearth & patio industries. The article concludes that identifying upfront the ultimate consumer target market segment and aligning the B2B brand to consumer demand is critical for commercial success. Strategic marketing and market communications services are therefore an important contributor to all other technical, regulatory and legal services offered by Lee Enterprises Consulting Inc, the worlds largest bioeconomy consulting group. Sustainability is a long-term business driver, anchored in societal fundamental values and not driven by topical politics (Figure 1). Academia is preoccupied by definition with the application of the scientific method to uncovering immutable laws. These discoveries are to inform the scientific community, public opinion and government policies. They take a long time to be transformed from scientific facts in the values held dear by the electorate at large, in sustainability case the story goes back to mid 20th century. MarketChemica Inc. is a marketing specialist for Lee Enterprises Consulting Inc. Since the electorate is at the same time the workforce for businesses it is only normal that these values will penetrate the business culture above and beyond the legal requirements imposed by government policies. In conclusion, the short democratic electoral cycle does not allow the easy reversal of a half of a century trend. For as long as academia continues to demonstrate that sustainability is a problem, bioeconomy will be part of the solution and marketing will be essential to create business opportunities. While the ideological clash provides the backdrop of macroeconomic societal trends, marketing remains the critical tool for maintaining demand for sustainable solutions at the microeconomic level. Figure 2 shows what consumers want across a wide range of industries. Interestingly, the consumer is looking beyond the product at raw materials and processes used in the manufacture of a product. Terminology might differ from one industry to another ranging from “clean label” to “free from” to “biodegradable” as it might be driven by sectorial/national legislation. There is however a common thread overarching all industries, countries and product categories that speaks to the need for a sustainable economy. Obviously, B2C brands have to meet their buyers’ needs and wants by disclosing the ingredients used by their formulations as well as raw materials and manufacturing processes. This creates wide opportunities to suppliers to B2C brand manufacturers by aligning their B2B brands to end game demands. By way of example, Green Biologics, Inc. agreed to supply in 2018 their patented GreenFlame® bio-based charcoal lighter fluid formulation exclusively to Kingsford Charcoal. 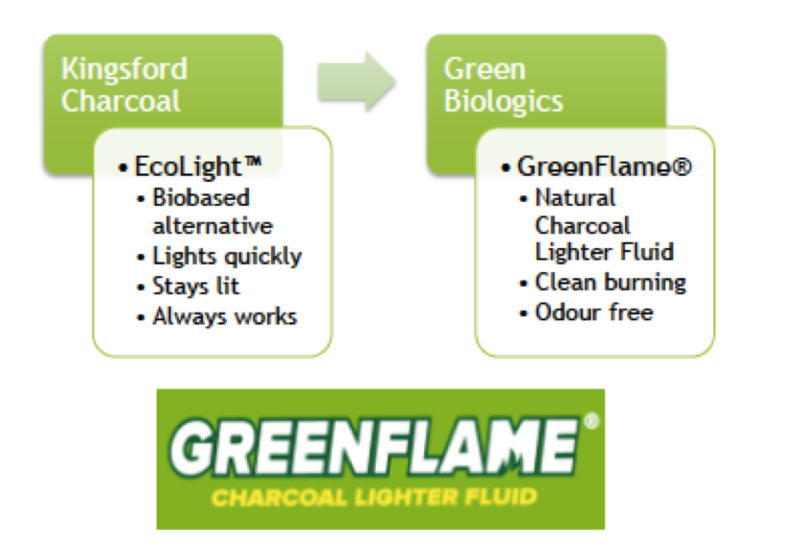 The licensing agreement builds on the successful 2017 introduction of GreenFlame®, a natural USDA BioPreferred® certified, clean-burning charcoal lighter fluid based on Green Biologics’ proprietary advanced fermentation process for biobutanol and acetone. Kingsford decided to market GBI’s formulation under their own brand EcoLight™, sold in large retail chains across US the market. The brand architecture along the supply chain is highlighted in Figure 3. 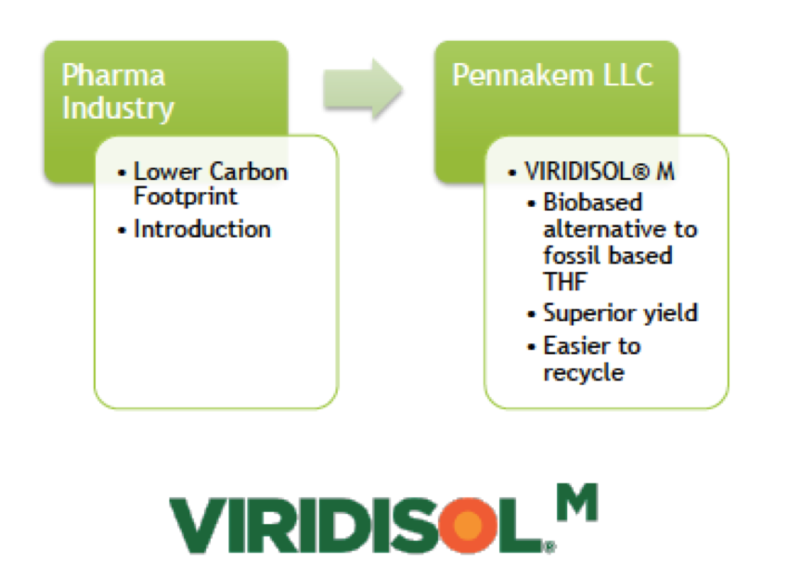 In another recent example, Pennakem LLC launched in 2018 the VIRIDISOL® range of solvents offering a biobased alternative to fossil based solvents (Figure 4). Pennakem marketing was very much aware that the pharmaceutical industry needed to reduce its carbon footprint due to use of notoriously large amounts of solvents in multistep synthesis. They understood that the consumer image of pharma companies is tied directly into the corporate social responsibility report. VIRIDISOL® M reduces the solvent specific consumption by comparison to oil based THF due to its biobased nature as well as easy recycling. Its brand positioning is therefore consistent with the pharmaceutical industry desired public image. A third and final example comes from the same company. 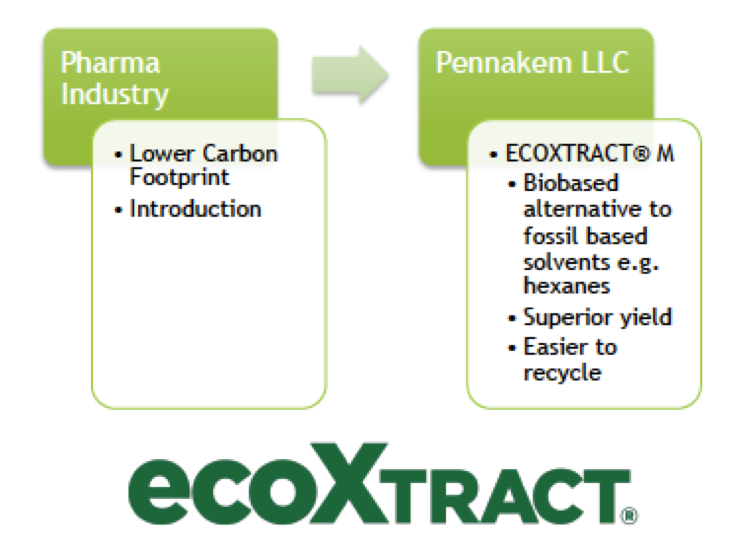 Pennakem LLC launched in 2018 ecoXTRACT®, a biobased alternative to hexane, a solvent used in the extraction of lipophilic moieties for F&F and cosmetic industries (Figure 5). 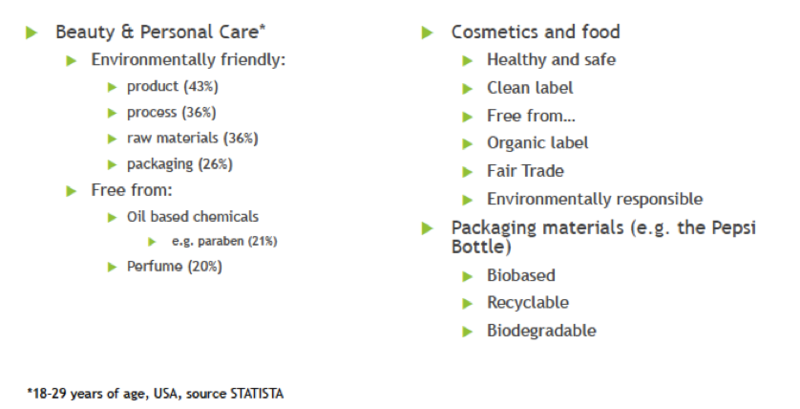 Various cosmetics and F&F brands have a need to differentiate their offering to consumers by using a natural, biobased solvent instead of the oil based hexanes and the B2B brand supports this. Charcoal lighter fluid market in US is one of countless potential markets for GreenFlame® biobutanol based formulation. Pharmaceutical solvent market for VIRIDISOL® M or cosmetics market for ecoXTRACT® are not necessarily obvious choices either. The launch of these brands was not done just for the sake of having a pretty name. All companies above looked in fact at the size of the B2C market driving their demand and they took the time to understand the positioning of the brands they are selling to. This is the object of strategic marketing. Unlike marketing communications strategic marketing identifies specific market segments that are large and profitable enough to meet the required ROI. Launching the B2B brands simply translates earlier strategic marketing decisions into efficient market communications. As a macroeconomic trend, sustainability is anchored deeply in long-term societal values, not passing political choices. Bioeconomy is one of several possible answers to the sustainability problem. LEC has the capability to support clients with best in class strategic marketing and communication consulting through its various member organizations including MarketChemica Inc.